Carl Paladino says his removal from the Buffalo School Board by New York State Education Commissioner MaryEllen Elia was wrong and he intends to fight it. He tells WBFO his highly-anticipated challenge will formally begin next week. Last month, Elia decided that Paladino inappropriately disclosed executive session information about teacher contract negotiations to the publication Artvoice. He was removed from his school board seat, effective immediately upon her ruling. That seat was filled last week by new Park District representative Catherine Flanagan-Priore. Carl Paladino (right) listens to remarks during a ceremony Thursday at the Western New York Maritime Charter School's new middle school building. 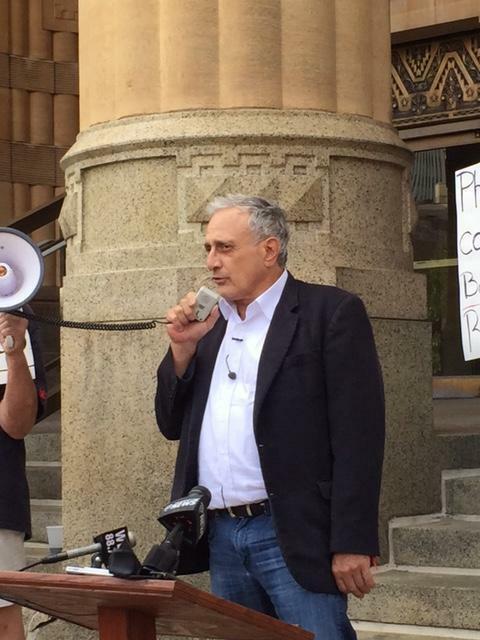 Paladino, who was removed from the Buffalo School Board by the State Education Commissioner last month, tells WBFO he plans for formally file his challenge of that ruling next week. Paladino, meanwhile, plans to appeal under New York State's Article 78, a proceeding which challenges the actions of administrative agencies and other government bodies. "Between now and what I do with our success with an Article 78, I will keep doing what I've always been doing," he said. "I'll keep advocating for education and I'll criticize where they have to be criticized and I'll support where they should be supported." Paladino appeared Thursday at the ribbon-cutting ceremony outside the Western New York Maritime Charter School's new middle school building on Buffum Street. The real estate development company he founded, Ellicott Development, led the renovation of the former Buffalo Public School 70 building. His company has worked before with charter and private schools and he hinted more projects will come in the future. He noted the high graduation rates among charter schools and the opportunities they provide to economically disadvantaged students. "Unfortunately, they have home experiences which are not that good, parents that are not tuned into what they should be doing as parents to help that child along," Paladino stated. "And we have quite a bit of dysfunction in our traditional public school system. These charters are winners." Paladino's disclosure about contract talks was not the first time he got in trouble for remarks made to Artvoice. Many wanted him removed from the Buffalo School Board soon after his controversial remarks, published in December. The remarks, which were part of a series of "wish lists" submitted by local personalities, included the wish that Barack Obama "die of mad cow disease" and for Michelle Obama to "return to being a male and let loose in the outback of Zimbabwe where she lives comfortably in a cave with Maxie the gorilla." He apologized for those remarks, also in Artvoice, stating "what is horrible is explaining to my 17 year old daughter how her hero could be so stupid." Paladino supporters and allies believe his removal from the school board was really a way to punish him for the December incident and not for the charge of publicly disclosing privileged information. WBFO asked him if, in the event his appeal is unsuccessful, he would be satisfied with his work with charter schools as his educational legacy. 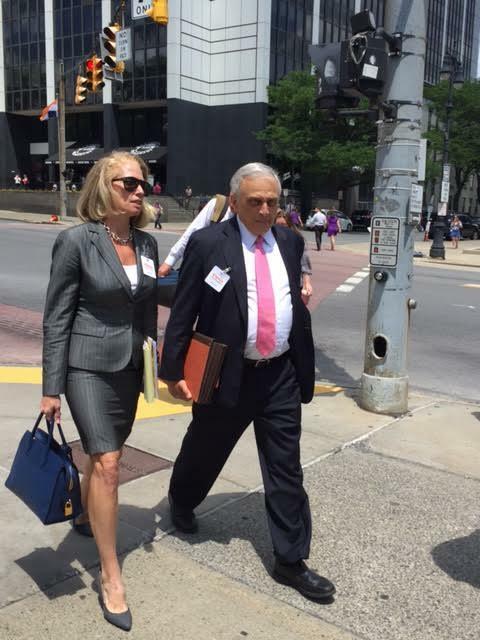 "I'm comfortable with what I've done," Paladino replied. "If I've moved that boulder five inches, I'm a happy guy. There's so much more than can be done and should be done, because it's not fair to the citizens of this community to have a board that is fully owned, lock, stock and barrel, by the (teacher) union that is its chief adversary." The Buffalo School Board is back up to nine members, after Catherine Flanagan-Priore was sworn in as the Park District member Wednesday. With longer school days and the addition of two community schools, the Buffalo School District is slowly taking on a new look. According to Buffalo News Education Reporter Jay Rey, supporters believe the changes will boost student achievement and parental involvement. As for another notable change - the removal of Carl Paladino from the School Board - Rey says, "It doesn't look like this is over." Buffalo News reporter Jay Rey reviews issues involving the Buffalo School District during his appearance on WBFO's Press Pass. State Supreme Court Justice Catherine Nugent-Panepinto Monday afternoon denied a temporary restraining order filed by former Buffalo School Board Park District member Carl Paladino to keep the seat vacant. The same day, the Buffalo School Board chose Paladino's replacement. The vacant seat on the Buffalo School Board is apparently very attractive to residents of South Buffalo. 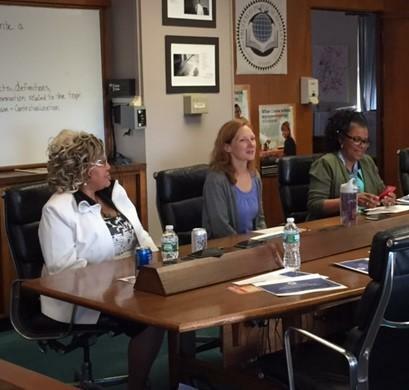 The board is winnowing through 15 candidates for the Park District seat vacated by Carl Paladino when State Education Commissioner MaryEllen Elia removed him. Carl Paladino has been removed from the Buffalo Board of Education by the New York State Department of Education. WBFO's senior reporter Eileen Buckley has reaction. The Buffalo Parent Teacher Organization (BPTO) is trying to put pressure on the State Education Commissioner to remove city school board member Carl Paladino. 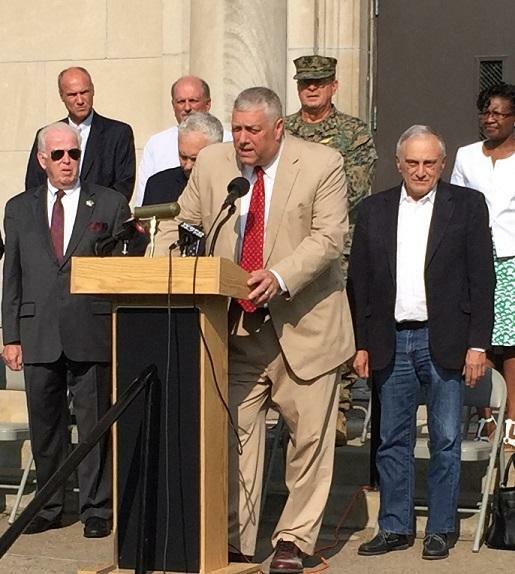 WBFO’s senior reporter Eileen Buckley says BPTO co-chair Larry Scott made a plea at a rally Sunday in Buffalo to denounce the violent racism that occurred in Charlottesville, Virginia. WBFO’s senior reporter Eileen Buckley says BPTO co-chair Larry Scott continues to demand NYSED Commissioner Elia remove Paladino. Testimony began Thursday in the long-awaited hearing for Buffalo School Board member Carl Paladino. 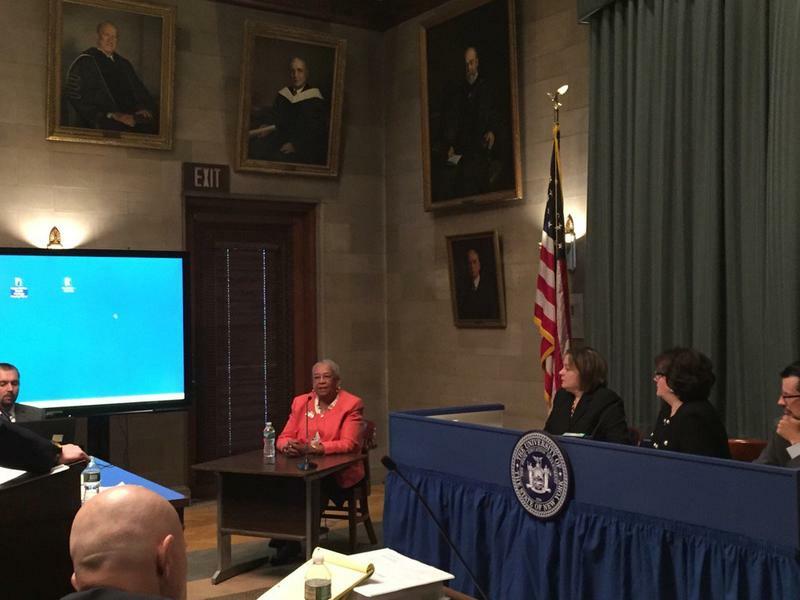 State Education Commissioner MaryEllen Elia is holding the hearing in Albany in response to a school board petition calling for Paladino's removal. 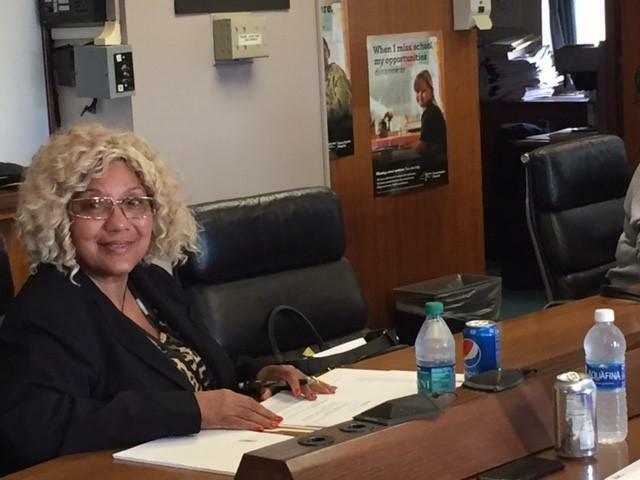 WBFO's senior reporter Eileen Buckley talks with Albany Correspondent Karen DeWitt about some of the testimony at Thursday's hearing. DeWitt is covering the hearing for WBFO. 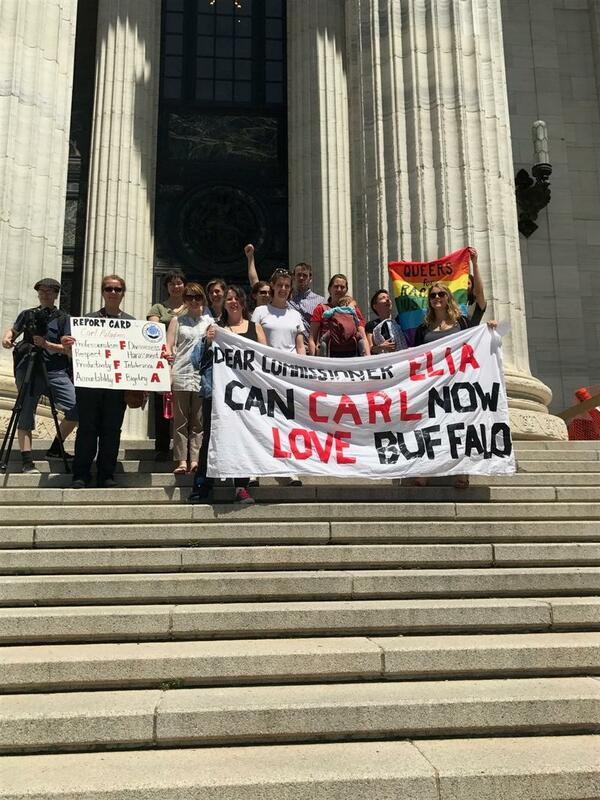 About a dozen local protesters appeared in the lobby of the New York State Education Department in Albany Wednesday demanding the immediate removal of Buffalo Board of Education member Carl Paladino. WBFO's senior reporter Eileen Buckley says protesters wanted to confront state Education Commissioner MaryEllen Elia. WBFO's senior reporter Eileen Buckley says protesters wanted to confront New York State Education Commissioner MaryEllen Elia.